Step up to one of the best high performance engine components on earth! 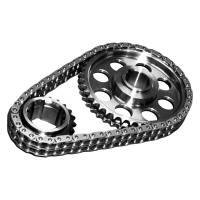 Rollmaster chain and sprocket timing system use the best materials available to product some of the best timing chain and gears in the world. Rollmaster has grown in coverage and availability, they have continually upgraded material, machinery, and processes to stay ahead of the curve on quality and provide accurate timing sets. Get your Rollmaster components at Butler LS.